There’s a new place to channel the Emerald Isle this St. Patrick’s Day. Drink Company, the same group behind the Cherry Blossom PUB, added Publin to its seasonal mix. The shamrock and whisky-heavy bar, situated in its own space next to the blossoms, runs through April 21. Head of Bar Concepts Paul Taylor says the two pop-up bars are tied together with a common theme of spring renewal. Like the lush blossom bar, Publin is fashioned after a verdant paradise with nearly two hundred four-leaf clovers. “It’s almost like an Epcot. You can go from DC to Japan to Ireland all in one place,” says Taylor. 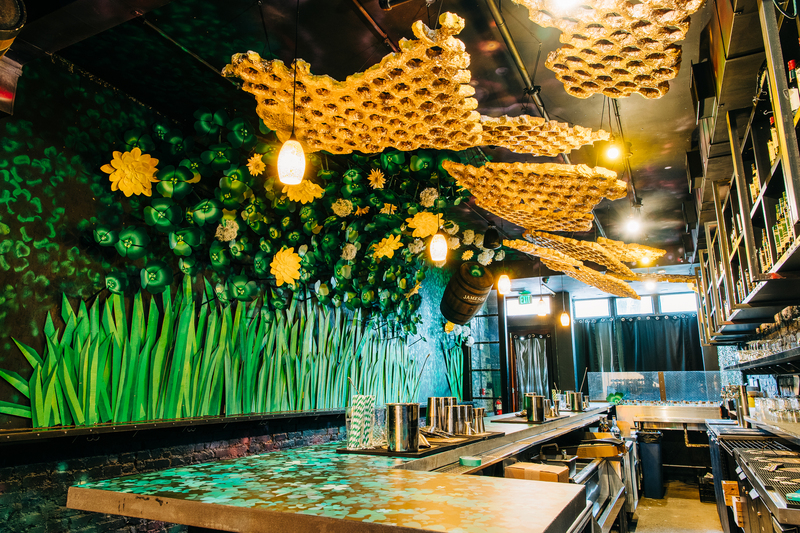 Suspended honey combs are a reference to bees in springtime and the honey flavors in whiskey. Photograph by Nick Karlin. Revelers can imbibe alongside massive wooden stalks of grass under a canopy of suspended honeycombs, which nod to both pollinators and the honey notes in certain whiskeys. Set to the tune of Irish folk music or Dropkick Murphys, the green-and-yellow color scheme also conjures Notre Dame’s school colors. Instagram a photo from the 180 degree camera set up. Photograph by Nick Karlin. The decorative barrels of whiskey and springtime motifs make for easy Instagram clout. Drink Company is elevating the photo opportunities to influencer levels. 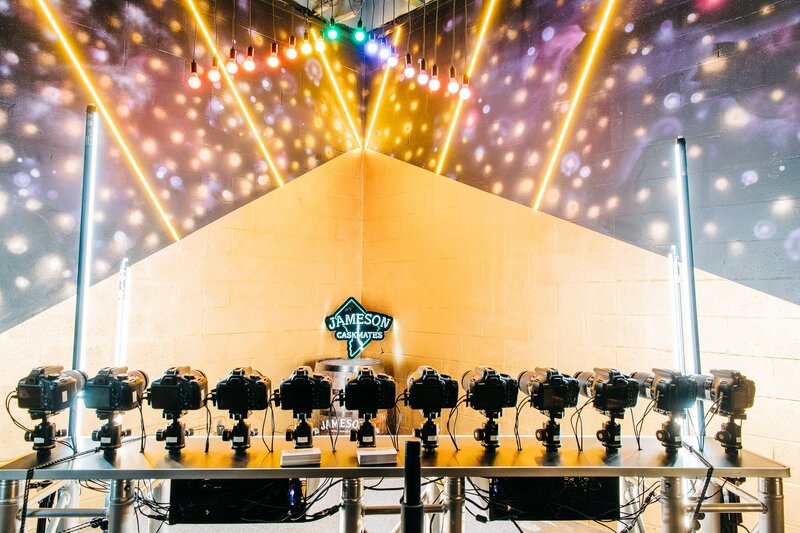 Instead of a photo booth you can get free shots from 14 cameras set up to create an 180-degree image. The result is a panoramic photo that oscillates back and forth like an advanced Boomerang video. The apple-flavored Four Leaf Closure combines two types of whiskey. Photograph by Nick Karlin. Whimsical decor aside, the menu reads like a crash course in Irish whiskey. Cocktails showcase the diversity of whiskeys thanks to unique distilling methods and barrel types. 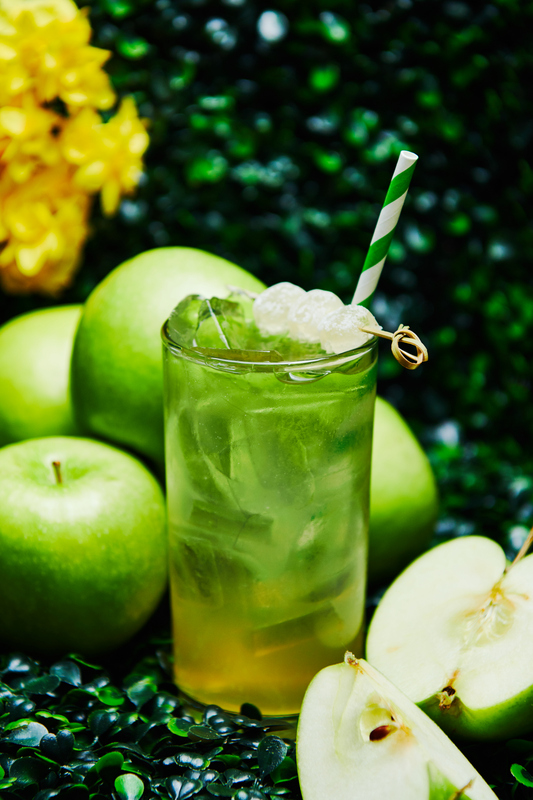 Order the Four Leaf Closure that combines two Irish whiskeys: an apple variety Taylor says is like drinking a “juicy orchard,” and a hoppy Jameson made in a craft IPA barrel. The drink can either warm up or cool down based on the weather, which makes it ideal for the transitional season. Also on the menu is a classic Irish coffee—no Reddi Wip here, the 1940s recipe calls for hot coffee, sweetened whiskey, and homemade whipped cream. For an Irish Cream Soda, Taylor mixes Jameson aged in a charred bourbon barrel with vanilla and cream soda, a drink that nostalgically reminds him of Stewart’s Fountain Classics. 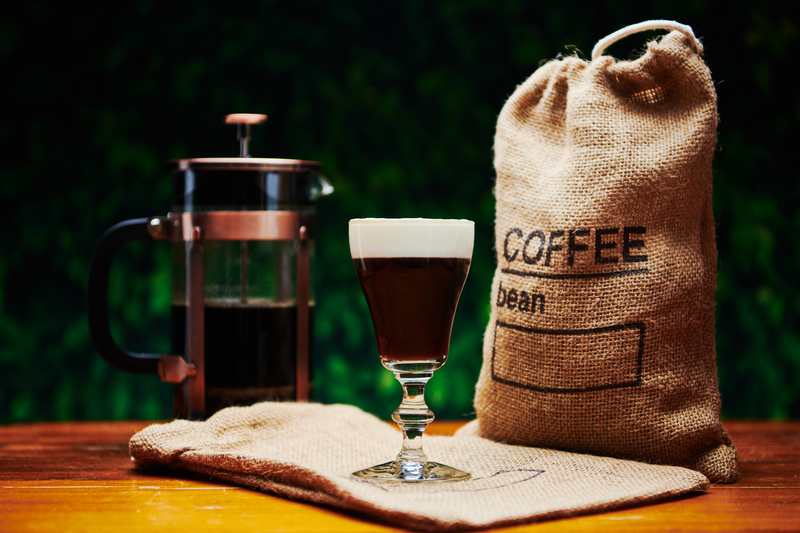 Irish Coffee is made with homemade whipped cream. Photograph by Nick Karlin. Other drinks are remixed versions of classic cocktails like the Manhattan-esque Tipperary and the Bananarac, a banana-tinged Sazerac. In addition to the cocktails, the team has curated a list of Irish spirits. Publin. 1843 7th St., NW. Open daily through April 21. Sunday through Thursday, 5 PM until 12:30 AM; through 1:30 AM on Friday and Saturday.